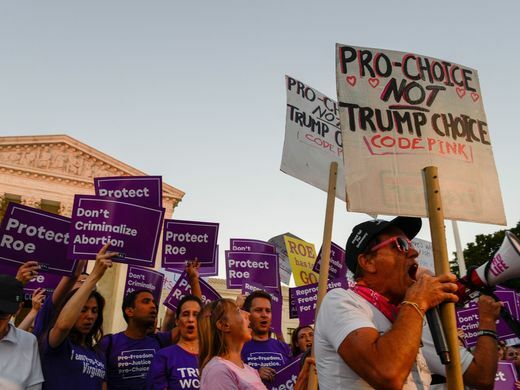 WASHINGTON — Younger generations of pro and anti-abortion advocates are digging in their heels and preparing for a long, drawn-out legal battle as President Trump alters access to reproductive care and courts across the country continue to rule on abortion. This past week Trump released proposed changes to Title X, a federal grant program that allocates funding for reproductive health care and contraceptives to low-income populations. The rule change would cut federal funding to family planning clinics such as Planned Parenthood that provide referrals for abortions. Younger abortion rights supporters condemn Trump’s recent actions. Leaders ages 14-to-25 are guiding the discussion on sexual and reproductive health care as members of Advocates for Youth, which is based in Washington, D.C. The organization has a network of young people at over 1,200 college campuses and in more than 120 countries. Julia Reticker-Flynn, 33, is the director of youth organizing and mobilization at Advocates for Youth and works with the group’s “1 in 3 Campaign,” which has over 1,300 published testimonies from women who shared why they did not regret their decisions to have an abortion. Reticker-Flynn said young people recognize that the Trump administration’s actions, such as his call for late-term abortion legislation, do not reflect science and the experiences of people seeking an abortion. For 18- to 29-year-olds, 42 percent said abortion should be legal under “certain circumstances” while 37 percent said abortion should be legal under “any circumstances.” For 30- to 49-year-olds those numbers are 50 percent and 30 percent, respectively. Although leaders in the anti-abortion youth group, Students For Life of America, in Fredericksburg, Virginia, said more young people are becoming part of the pro-life generation. Students For Life of America conducted a poll of 18- to 34-year-olds in January, which showed that 7 in 10 millennials support limits on abortion through certain policies and 51 percent said that they opposed Roe v. Wade with the understanding that the decision permits abortion in all 9 months of pregnancy. Matt Lamb, 25, is the director of communications for Students For Life of America, which has 1,200 groups across the country in high schools and college campuses with young people ranging from 14- to 25-years-old. He said his generation better understands the realities of abortion through the use of technology. President and founder of Secular Pro-Life, Kelsey Hazzard, 30, agrees with the assessment that the younger generation is using technology to speak out against abortion. Hazzard started Secular Pro-Life as a 20-year-old at the University of Miami because she wanted to be a part of a non-religious anti-abortion group. The organization congregates solely online and has an active social media presence with more than 29,000 followers on Facebook and Twitter combined. Dr. Krystal Redman, 32, of Atlanta, Georgia, works with young people as the executive director of SPARK for Reproductive Justice NOW, an organization focused on advocating for people in marginalized communities to freely make decisions about their gender and bodies. The organization has a leadership program for queer and transgender youth of color and ally youth of color who want to be a part of the reproductive justice movement. “Without tackling or addressing the oppressions that are specifically anchored on people of color, queer people, and black folks, then you’re not really getting to the root of reproductive health or rights,” Redman said. While young leaders are taking action in the abortion debate, people born before Roe are responding to how the Trump administration’s recent actions against abortion affect future generations. Dr. Willie Parker, 56, is an abortion provider in Birmingham, Alabama, where access to reproductive health services is restricted. Parker said the restrictions to abortion access send a negative message to women of all ages. Georgette Forney, 58, of Sewickley, Pennsylvania, is pleased with the Trump administration’s stance on abortion. She is the co-founder of the Silent No More Awareness Campaign, which has provided an online community for over 2,700 testimonies from women and men who regret having an abortion. Forney said young people who were born after the Roe decision in 1973 are more aware of the dangers of abortion because they have faced the reality that they could have been aborted. One of those young people is Forney’s 29-year-old daughter. The Westchester Coalition for Legal Abortion-Choice Matters in White Plains, New York, has existed since 1972 and continues to advocate for the right to choose as a privacy matter. Catherine Lederer-Plaskett is the president of the group and since 2004 she has worked on passing the Reproductive Health Act in New York, which legalized abortions after 24 weeks in the instance where the life or health of a woman is threatened. Lederer-Plaskett said the passage of the Reproductive Health Act has been essential to protecting women’s reproductive rights but abortion cases in other states are undermining the legal standing of Roe.